Reggie Robinson of the Meigs County Community Prevention Coalition addresses those in attendance at the Chamber Lunch and Learn. Robin Harris, executive director of the Gallia-Jackson-Meigs Board of Alcohol, Drug Addiction and Mental Health Services, addresses those in attendance at the Chamber Lunch and Learn. 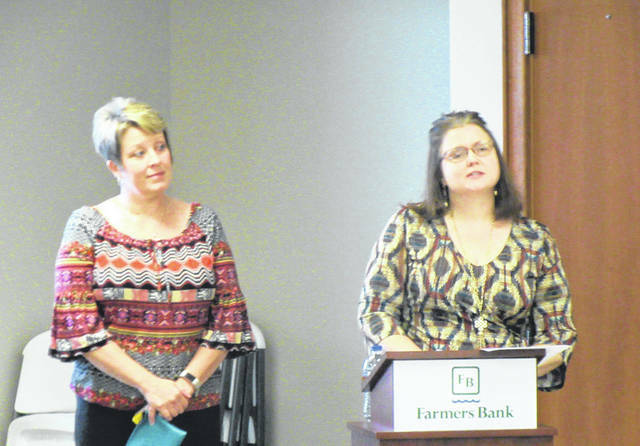 Leanne Cunningham and Courtney Midkiff from the Meigs County Health Department spoke as part of the Chamber Lunch and Learn last week. POMEROY — The drug epidemic is one that impacts everyone in some way, and businesses are not exempt from that. 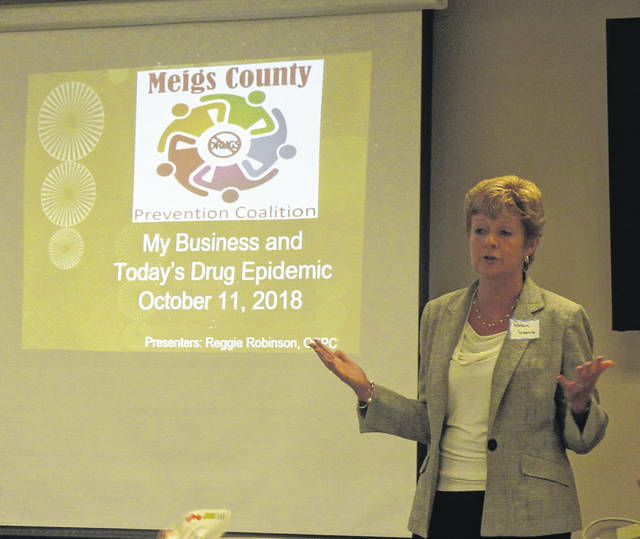 The drug epidemic and the impact on businesses was the topic of the recent Chamber of Commerce Lunch and Learn with a presentation by the Meigs County Community Prevention Coalition. The event was sponsored by the Prevention Coalition, Get Healthy Meigs and the Chamber of Commerce. Reggie Robinson and Robin Harris spoke to the group, along with Courtney Midkiff and Leanne Cunningham from the Meigs County Health Department about the services which they can provide including Narcan kits and Get Healthy Meigs. 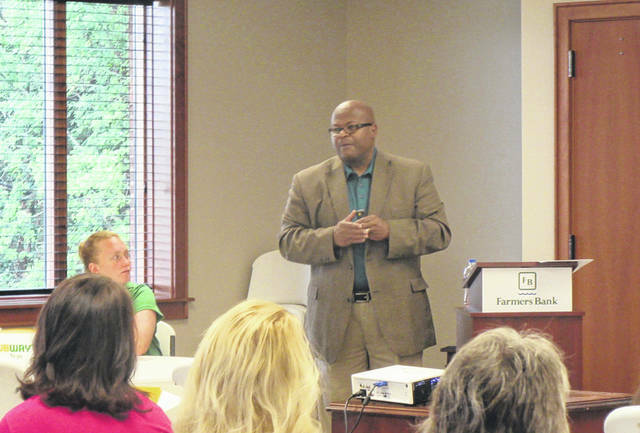 Robinson, who is the community coordinator for Health Recovery Services working on prevention efforts in six counties, spoke about the prevention coalition before turning to the current state of the drug problem as it impacts business. The coalition is a central gathering point for area organizations and agencies to come together, work with one another, and share ideas. Robinson described the coalition as a rallying point for efforts. Among those efforts was the first ever drug prevention day at an Ohio county fair which was held this year at the Meigs County Fair, the Be Present campaign and plans to bring Operation Street Smart to area schools in the coming year. Plans are also being made for a county-wide prevention day for middle school students. Turning to the business aspect, Robinson encouraged businesses to have a strong drug policy and the have it reviewed by their legal counsel. Among the business concerns can be an increase in workplace accidents and injuries. A strong policy will help to show a strong stance on safety, with employers legally obligated to provide a safe workplace. Harris, who is the Executive Director of the Gallia-Jackson-Meigs Board of Alcohol, Drug Addiction and Mental Health Services, explained that there are many working behind the scenes to make things happen with regard to developing prevention services and treatment options. No one is immune to the drug problem, said Harris, whether it is finding a needle or losing a family member to an overdose. Harris explained that one of the ways they are looking to improve on treatment to look at the entire picture for the person and help them to rebuild a life. Steps have been taken at Hopewell Health Centers to help with rapid access to treatment and the available for detox, Vivitrol, counseling and a case worker to assist with the process. Midkiff spoke of the Community Health Improvement Plan which was implemented last year and included areas of focus to improve the health a wellness of those in Meigs County. Among the items included were mental health and substance abuse. Cunningham stated that narcan kits are available through the health department, as well as the training on how to use the kits. Narcan is used to reverse the effects of opioid overdoses. The next Meigs County Community Prevention Coalition will meet at 12:30 p.m. on Oct. 24 at the Robert E Byer Emergency Operations Center on Pomeroy Pike. The next Get Healthy Meigs meeting will be held in January. https://www.mydailysentinel.com/wp-content/uploads/sites/14/2018/10/web1_10.17-Chamber-1_ne20181017143053361.jpgReggie Robinson of the Meigs County Community Prevention Coalition addresses those in attendance at the Chamber Lunch and Learn. https://www.mydailysentinel.com/wp-content/uploads/sites/14/2018/10/web1_10.17-Chamber-2_ne2018101714305664.jpgRobin Harris, executive director of the Gallia-Jackson-Meigs Board of Alcohol, Drug Addiction and Mental Health Services, addresses those in attendance at the Chamber Lunch and Learn. https://www.mydailysentinel.com/wp-content/uploads/sites/14/2018/10/web1_10.17-Chamber-3_ne20181017143058385.jpgLeanne Cunningham and Courtney Midkiff from the Meigs County Health Department spoke as part of the Chamber Lunch and Learn last week.